Journalist | Write to the Point! Many Connecticut residents have visited the Mark Twain House & Museum, and even more may have endlessly searched for a reliable local news source. These two merged together Wednesday into one woman, the editor of CT News Junkie, Christine Stuart. Updated daily, Stuart’s popular Connecticut news site includes original reporting on state politics, public policy, the courts, and the complexities of the health care system. 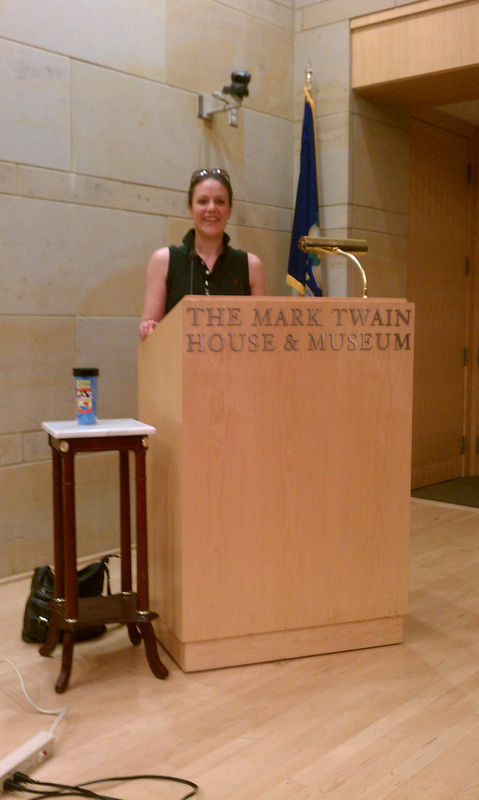 This Central Connecticut State University graduate and editor-in-chief of one of Connecticut’s leading news websites addressed a group of young journalists at The Mark Twain House & Museum. Stuart discussed how she got her start in journalism and how the young writers can get theirs, too. The apprentices of the Write to the Point! Neighborhood Studios program eagerly questioned Christine about everything from her favorite news story to how old she is. The answer is 36, by the way. A few months after Stuart graduated from CCSU in 1999, the Hartford Advocate offered her a position as a reporter. She was glad to take this position. She’d spent months waiting to hear from any one of the many news organizations she’d sent resumes to after graduation. Stuart told the writing group that before she started CT News Junkie, she would typically have to take on two or three jobs besides reporting, just to get by. However, after struggling to make a name for herself in the news industry, Stuart finally landed a better job at the Journal Inquirer in Manchester. At the Journal Inquirer, Stuart covered a variety of beats, including the city of East Hartford, the state’s trash authority and a regional water commission. In early 2006, after spending nearly four years as a reporter at the Journal Inquirer, Stuart bought CT News Junkie from a friend. She and her husband, Doug Hardy got this news site on its journalistic feet that same year. Regular viewers of the site, she said, check it about four times a day. As one of only five women reporters at the Capitol, Stuart primarily covers government and politics. When asked her advice for beginner journalists, Stuart had a simple answer. So, shut up and listen.